Deal offer ends at 7am on Thursday, 17th September! Advanced booking is not required. Voucher is valid until 31st Oct 2015; 7 days: 10am–4pm; subject to availability. Sometimes forget you live in one of the most beautiful countries in the world? 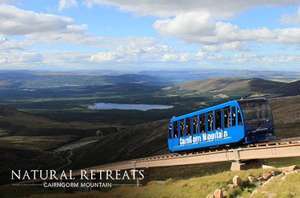 Put yourself back on the right track with two tickets to ride the UK’s highest funicular railway at Natural Retreats CairnGorm Mountain; a 4 star Scottish Tourist Board attraction for just £10. Take a journey up Britain's 6th highest mountain with two tickets to ride the UK’s highest funicular railway at Natural Retreats CairnGorm Mountain. Surrounded by spectacular scenery, this is the safest and most comfortable way for visitors of all ages and ability to enjoy a journey that takes you 1097m above sea level! Once at the top, you can gaze out from the viewing terrace, where you can see some of Scotland's most stunning scenery: rolling hills, snow-capped mountains and lochs, all from 3,500ft. You'll also see a mountain exhibition, Outfitters Shop selling outdoor clothing, accessories and gifts as well as the highest postbox in the UK. And if you need to refuel you can even enjoy a Starbucks coffee or head to The Storehouse restaurant boasting a variety of home-made dishes, daily specials, cakes and pastries all made in-house. You'll also have the right to say you've eaten in the highest restaurant in the UK! The funicular railway at Natural Retreats CairnGorm Mountain is currently rated 4.5 out of 5. “We were taken here by friends for the first time and all of us loved it! The funicular ride is super, but the views from the top of the mountain are breathtaking! The funicular is great fun! There's a little museum, cafe and shop on top, so no one's going to be bored." Groups are welcome; multiple purchases and use is not permitted for commercial gains (i.e. coach parties, tour operators, etc.). Duration: CairnGorm Mountain recommends allowing 2 hours to enjoy the experience. Please dress for the weather should you wish to enjoy the viewing terrace. Due to unexplained maintenance or very poor weather conditions the funicular railway may not operate, please check online before you travel. Funicular passengers are not permitted to exit the top station unless booked on a guided walk or a guided mountain bike descent. Animals, other than guide dogs and hearing assistance dogs are not permitted. This is a great offer and a great experience. We went yesterday. We took the train to Aviemore, then the bus from the station to the Cairngorm Ski Centre where the Funicular starts. The bus cost £3.80 return. Highly recommend this trip. Scotland the Country at the Top of the UK at the moment. You can surely take a quick sneak outside the top station. We were there in April, and saw a few families playing outside with the snow. We also walked a bit outside the station. There is a great view from inside the building, too! Off to Scotland in a couple of weeks and staying nearby for the first week so ordered deal and hoping for a clear day. Thanks for posting. Off to Scotland in a couple of weeks and staying nearby for the first … Off to Scotland in a couple of weeks and staying nearby for the first week so ordered deal and hoping for a clear day. Thanks for posting. Be careful with this deal. I asked my wife if she wanted me to take her up the funicular and she slapped my face and hasn't spoken to me for a day now. Cold. Be careful with this deal. I asked my wife if she wanted me to take her … Be careful with this deal. I asked my wife if she wanted me to take her up the funicular and she slapped my face and hasn't spoken to me for a day now. Cold. Have been here and you can go outside onto a kind of viewing platform at the top but by golly there will be a cold wind blowing whatever time of year you go! Hot. However lots of rules. I'll wait till theres snow and go skiing there instead. Its ridiculous that people try to make you think you cannot walk on a hill without paying a guide. There is no law in scotland which would prohibit you from walking on the hill from the top and wonder how they might try to prevent you? Its ridiculous that people try to make you think you cannot walk on a … Its ridiculous that people try to make you think you cannot walk on a hill without paying a guide. There is no law in scotland which would prohibit you from walking on the hill from the top and wonder how they might try to prevent you? Before we first went there, I read that same warning on their website, and I was totally put off by it, imagining, I would not be allowed to leave the funicular train at top station at all. But to my observation in reality, this just serves as safeguarding, because mainly the visitors there are families with little children. Mainly, this warning should be taken as ''do not attempt to go walking outside top station without proper equipment'', for example. The exit to the mountain from the area you get to by the funicular is closed off and can only be opened by staff members - as you use the doors skiers would use in winter. The only way to get out on the mountain is to walk all the way up from the bottom, which isn't a hard walk. It just takes time. The exit to the mountain from the area you get to by the funicular is … The exit to the mountain from the area you get to by the funicular is closed off and can only be opened by staff members - as you use the doors skiers would use in winter.The only way to get out on the mountain is to walk all the way up from the bottom, which isn't a hard walk. It just takes time. ​Yeah, this is also a good healthy option, while there is no snow yet!